This week’s Featured Onepager is a lesson in great web design. 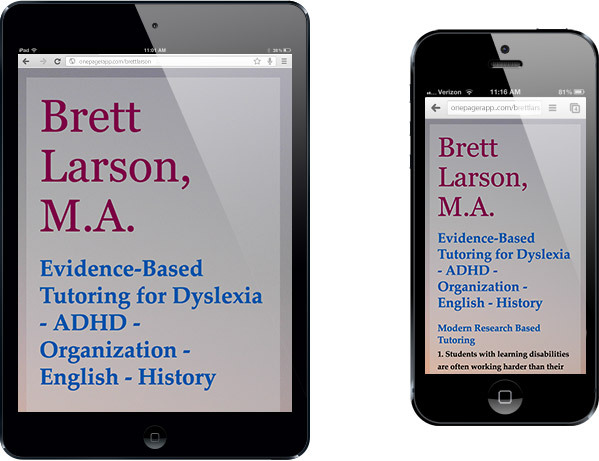 Brett Larson is a tutor from Portland, Oregon, who specializes in dyslexia, ADHD, and organization. 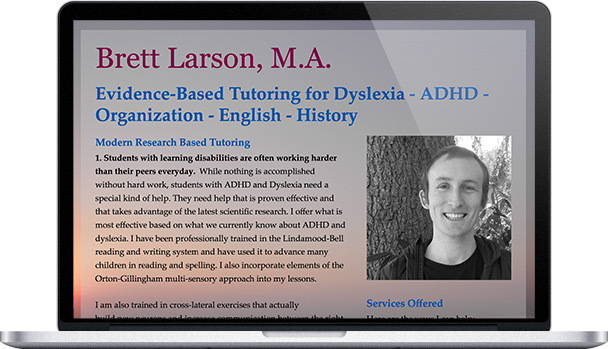 Brett has structured his site in a way that makes it super easy to learn about his methods and dedication to tutoring. At the top of the page, he clearly states his area of expertise, so that visitors immediately know if his experience fits with their children’s needs. He then breaks up the the main text into digestible sections, with bold subheaders summarizing each paragraph (which are very thoughtful and informative, we might add). He also provides a useful bird’s-eye view of his services in the form of a bulleted list in the right sidebar, followed by another list of his areas of focus. In addition to familiarizing prospective clients with his background, Brett’s site also serves as a testament to his expert organizational skills. We also love the simple, elegant visuals Brett uses. The slightly blurred photo of a sunset is an excellent choice for his background picture—by keeping the red sun off-center and placing the text space over the sky, it creates visual intrigue without distracting from the words. The mauves and grays have an overall calming effect as well, making readers feel at ease as they read. Finally, the picture of himself in the top right adds a great personal touch—choosing a tutor for their children is a big decision for parents, so being able to put a (smiling) face to the name adds a reassuring human element to the site. Congratulations, Brett—your site is a textbook case of great web design!